Migration from Brightcove to Brid is a straightforward and easy process. Brid has just the right tools you can use to easily migrate your entire video library from Brightcove by following a couple of simple steps. In this step we use the tool found here - https://github.com/BrightcoveLearning/18026-cms-api-sample-mrss-feed-playlist to create MRSS video feeds from your Brightcove library. 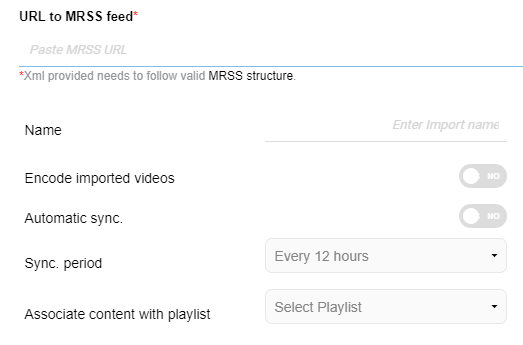 The above tool will create an MRSS feed of your playlist(s). Now that you have an MRSS feed, you need to create a .xml file som ewhere where it would be externally available and then grab the URL to where it is hosted. Once this is prepared, you are ready to go to the next step. Login into your account in Brid and select a site from the MANAGE VIDEOS option on the main left-hand menu. 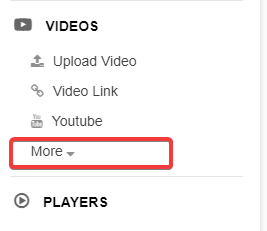 Under the VIDEO section, click on MORE to open up additional options. Now select the ADD FEED option under IMPORT MRSS. In the top input field just paste the MRSS feed URL which points to the .xml file you created in the step before. 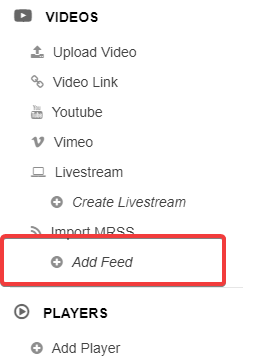 Add a name for your feed so you can easily distinguish between multiple imported feeds . Check the encoded imported videos option if you want all your videos from the feed to be encoded and hosted by us. If this option is left unchecked, all video URL’s from the feed will just be copied into the CMS and hosting will stay with your third-party provider. If your feeds are dynamic in nature (they populate dynamically from an external source), you may want to check our automatic sync option and set an interval for it so our system automatically checks this feed each X hours to see if there is any new content added into your feed(s). If so, our system will fetch these new videos and add them to your Brid library. Last but not least, you can associate all videos from a feed to a custom created playlist in Brid. This way you can easily translate all playlist and videos from that playlist in Brightcove to Brid.